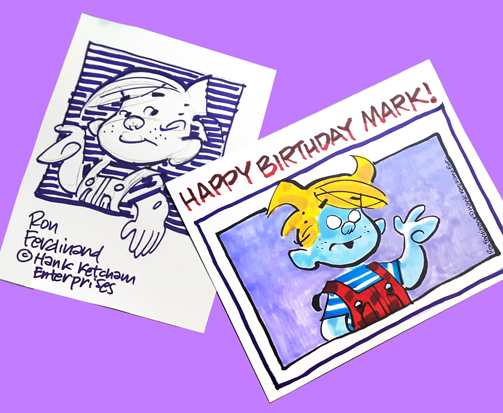 Ron Ferdinand, the artist maestro behind the Sunday Dennis the Menace comic strip, honored me with this special drawing of Dennis the Menace as Zombie Boy for my recent birthday! I was floored to have someone I admire so much who has such a history in the comic strip business create something so wonderful, especially for me! Ron has worked on the Dennis the Menace comic strip since 1981. He now does the Sunday edition of the strip for King Features which regularly runs it in about 1,000 newspapers. The strip has been in the top ten of popular comic strips almost since its inception in 1951. And in addition to the special Zombie Boy illustration, Ron included a drawing of Dennis the Menace himself! I tell you it’s a treasure, folks! I’m overjoyed to add these two wonderful works to my wall! Thanks so much, Ron! That’s great, Mark! Ron is an especially nice guy, as well as being a talented artist.